For the past several years, we’ve spent the fall sessions of LDS general conference at Gordon’s family cabin. I love listening to Church leaders in the mountains. The fall leaves are beautiful, everything smells amazing, the only other noise comes from birds and chipmunks, and no one has cell reception. There are no distractions, and the radio signal comes in loud and clear. If I have anything to say about it, we’ll keep doing this forever. Of course, there are only eight total hours of conference. That gives us the rest of the weekend to light things on fire, build stuff, shoot targets, and pretend we live in the 1800s. 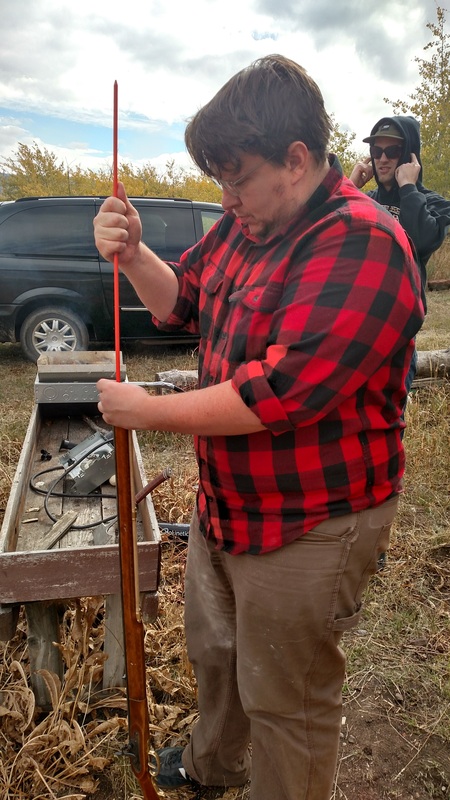 Gordon finally got to shoot the black powder rifle he built this year. I have to confess a brief lack of faith. I was a little afraid the barrel might explode and mangle Gordon (because hey, homemade gun). Good news, his face is still intact. In fact, after a couple misfires and an adjustment, the gun proved reliable—and really fun to shoot. There’s something really satisfying about measuring and pouring powder and ramming it with a ball down the barrel of the rifle. And if we ever get caught in a civil war reenactment or transported back in time, we are much better prepared. Gordon and Curtis fired up the forge again to work on knives and a few other projects. 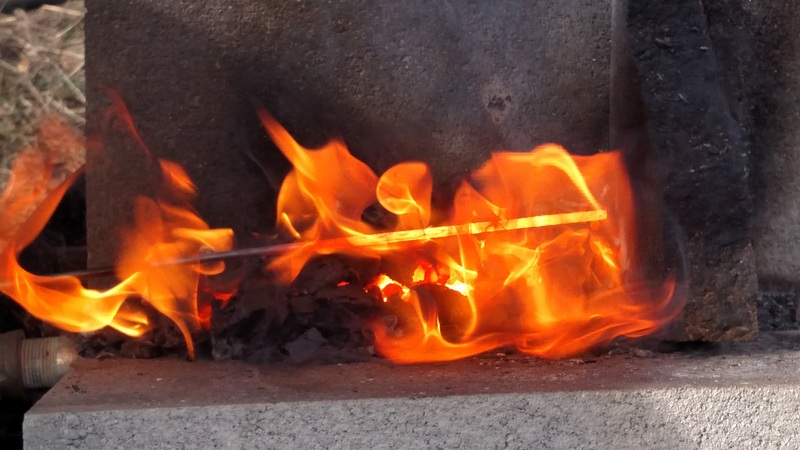 Curtis used the lit forge as an opportunity to make some char cloth firestarters, which will be very helpful for emergency prep and camping. We also brought up a large piece of leather to make sheaths for the knives when they were done. We still have almost 1/4 of a cow left, so we are going to have to come up with some more leather projects. Maybe Gordon can call on all his Cub Scout camp experience and stamp our names on belts. I started a denim quilt ten years ago that I have never managed to finish. I’ve saved all of our worn out jeans and occasionally pull everything out and cut a few squares, but I just couldn’t muster the energy to actually finish it (guys, cutting denim is way harder than cutting cotton quilt fabric). This weekend I decided I’d better use the cabin time to make some progress. So I brought several bags of denim, a good pair of scissors, and a ruler. Wonder of wonders, I actually managed to cut all the jeans I had into squares. Give me another five years and I may even sew them together. Bright side, it made me feel like my pioneer ancestors would be proud of my thrift and recycling skills. We took turns cooking meals for everyone. The kitchen has a nice propane stove that was perfect for breakfast. When it came to other meals, we mostly used the campfire. It was perfect for tinfoil dinners, our stew and chili night, and a tri-tip roast on Monday. And as long as there is a fire going, every meal can end with a roasted marshmallow. I’ll post more details about some of these later. What do you do for conference?